These folks claim that if we need more money we can just borrow it from the Federal Reserve. The Federal Reserve can just print or digitize more money, and then loan it to the United States Treasury. They claim that this borrowing has no effect on the economy, as this borrowed money is exactly the same as all other money. In fact most Keynesian economists agree. Then why pay taxes? You can only make money by virtue of your sweat, your mind, or as a return on your investment. You probably work during the day, and probably more than a few nights and weekends as well. You don’t have a printing press (or the digital equivalent) in your basement. You have to work hard for your money. 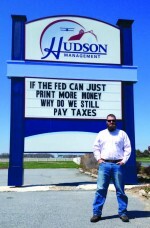 But if they can just print more out of thin air, then the bottom line is that the government doesn’t need your money. They can just go create their own! What better way to stimulate Main Street? Eliminate an unnecessary and outdated tax and kick-start the economy from the ground floor. Give the people a chance to keep their own money. Think about the stimulating effect that would have on the economy! We’re told by all the experts that this newly borrowed money has the same value, so what difference does it make? Just borrow all the money that the government needs to run, and then perhaps a little extra for contingency purposes. Instead, the government basically holds a gun to your head and forces you to pay taxes. You have no choice in the matter. They throw you in jail if you refuse. So which is it? Is there a downside to the national debt; or is taxation about something entirely different than simply paying our fair share of the government’s bills? It cannot be both. Otherwise, why are we still paying taxes?